I used to catch Dixie Dave and the rest of guys from Weedeater just about every other weekend in my home town of Wilmington, NC. Tonight the stoner doom ‘tussin maniacs will be slumping through NYC for the Nine-Toe Tour at Webster Hall. Care to guess why it’s called the “Nine-Toe” Tour? Well, Dixie Dave shot off his toe while cleaning his shotgun prior to recording a new album. That’s the South for ya! 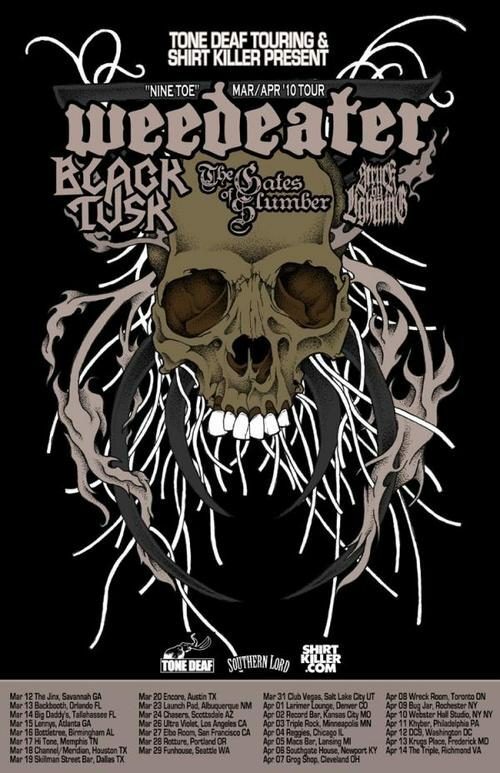 On the bill alongside them will be Black Tusk, The Gates of Slumber and Struck By Lightning. If you’re into some heavy-duty, down-South, sludgy stoner doom, swing through! The event details are here.